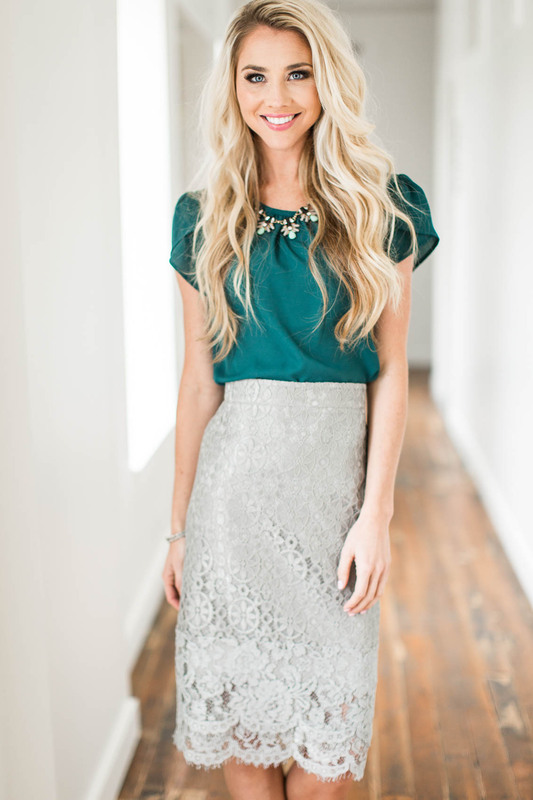 This gorgeous lace skirt really stands out! The full lace overlay is an exact match to the lining, and the tiered eyelash lace fringe is so flirty & feminine. This knee-length pencil skirt is available in 3 stunning colors, and looks great with either solid or patterned tops. Fully lined, side zipper closure, plus a hidden elastic waistband (in the back only) for the perfect fit! Also available in Burgundy Lace and Pink Lace. Worn here with our Drape Chiffon Top in Soft Pink and our Chiffon Top in Teal. Length: XS-S 24.5", M-L 25", XL-2XL 25.5" *This is the length of the skirt including the lace. Please note that the lining is an inch or so shorter than the lace.